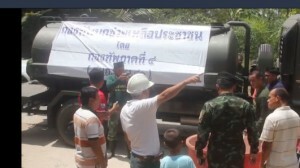 The 4th Army Area Command has distributed water supply to people in drought-affected areas in Nakhon Si Thammarat. One district in the province has been declared a disaster zone. More than 200 army officers from the 4th Army Area Command on Wednesday distributed 6,000 liters of water to drought-affected families in Nakhon Si Thammarat province. Water supply was given to them after community leaders made an urgent request for it, saying there were not sufficient manpower and vehicles to help all drought-affected people in the province. People in Nakhon Si Thammarat are currently suffering from a shortage of water for consumption. Agricultural areas are also severely affected by drought. Mueang Nakhon Si Thammarat district was declared a disaster area. 5,660 households in 28 villages are in need of urgent assistance.